Katie Norris is a MacGyver of mothers. Of course, she's not making bombs with a stick of chewing gum or diffusing missiles with a bent paperclip, but she is teaching her two young children to entertain themselves and learn from playing with everyday household objects. Rumor has it that she once scored thirty minutes of gloriously uninterrupted household silence with just a muffin pan and multicolored buttons. 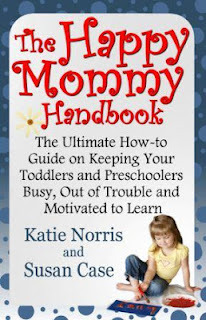 In the book, The Happy Mommy Handbook (co-authored by Norris and Susan Case), these types of activities and tips are outlined for parents of young children. The premise? Children behave better when they're exposed to stimulating, age-appropriate tasks that encourage exploration and hands-on learning. Some of the book's suggested activities are ones that we already practice in our household regularly. Even so, when I reflect on my daily parenting, I still have room to implement more. For example, I've never had my children hone their fine motor skills by setting up a station at the kitchen table where they can pour sand through funnels and between bowls. Nor have I ever created simple sorting games to help my daughters learn categorization and practice independent play. If you're looking for ideas but don't know where to start or what products to buy, check out The Happy Mommy Handbook on Amazon. Also, stop by Katie's blog, Mommy with a Selective Memory, to learn even more craft and project ideas. On those days when you feel like you're children are out of hand, you don't need a stick of chewing gum to blow down a wall so you can escape. Instead, turn to some simple and straightforward projects, and you'll find your way out of many tight parenting binds.